FOX IV Technologies NEW N6954 Linerfree Print and Apply system is a revolutionary breakthrough in liner-free print and apply design. With ZERO liner and ribbon waste, it is an environmentally friendly labeling system that is also easy to use and maintain. What makes the N6954 Linerfree different from other linerless labeling systems is the unique Catalyst™ adhesive technology from NuLabel Technologies. 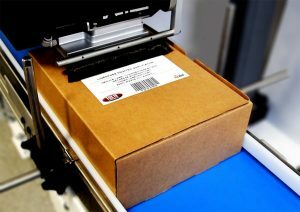 The Catalyst system utilizes label stock with a special dry adhesive that is activated after the label is printed and cut to size. This eliminates sticky adhesive from traveling through the printer applicator, clinging to rollers, the cutter, and the print head, that can lead maintenance headaches. The dry adhesive is activated using a water-based solution that is sprayed onto the cut label, just prior to automatic application. Additionally, because other linerless stocks must be top-coated with a release agent to prevent the stock sticking to itself, the Catalyst label stock, including the activation solution, is less expensive than traditional linerless label stocks as well as standard pressure sensitive labels. While the N6954 is compact in size, it is big on functionality. The system is capable of holding a 13.75″ roll of Catalyst label stock, which equates to a quantity of 6200 4″ x 6″ labels, about 2400 more 4″ x 6″ labels on a than a 14″ roll of pressure sensitive labels. It features an Allen-Bradley Micrologix PLC for simple integration into production lines. The PLC makes integrating into WCS seamless, allowing information to be pulled directly from the N6954’s PLC through an Ethernet IP for remote monitoring and data collection. With bi-directional communication through an addressable Ethernet I/O, the need for a discreet I/O package is eliminated. Customer specific PLC tags can be written and mapped as data outputs. Additionally, the N6954 can be operated with a PC as a stand-alone labeling system. 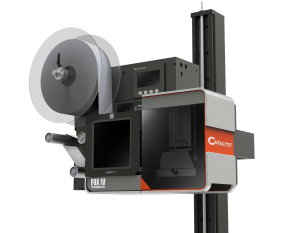 Operator friendly features include a modular print engine for ease of maintenance and a full color, 4.3″ diagonal display. The display is easily visible with intuitive controls, graphical displays for operating function, and warnings/fault indicators. The simple label path diagram is screened directly onto the N6954’s center wall to make roll changeovers fast and efficient. Companies will see several benefits from using the FOX IV N6954. Because there are more labels per roll than traditional pressure sensitive labels, roll changeovers are minimized and production time maximized . It is estimated that for every 1 million 4″ x 6″ liner-free labels applied, approximately 196 roll changes are eliminated. Also, downtime and maintenance time are reduced since the rollers are no longer exposed to adhesive which can cause pre-mature wear on parts. The environmental impact is also a key benefit. With the removal of the label liner, thousands of pounds per year of liner waste is removed from the waste stream and disposal time non-existent. One of the largest benefits is the cost of the label itself. By removing the cost of the label liner and any top-coating costs seen with other linerless labels, the label cost is actually reduced. Companies can expect to see up to a 30% savings in label costs over traditional pressure sensitive labels while becoming more environmentally friendly. The FOX IV N6954 Liner-free Print and Apply with Catalyst™ technology is ideal for case and carton labeling in shipping, distribution, warehousing and logistics applications. Interested parties can see live demonstrations of the N6954 at FOX IV’s Pack Expo 2016 Booth #N-5737.